Note: Archaeologists don’t dig up dinosaurs… or fossils… but we borrowed this method from our Paleontology friends. Index fossils are fossils that are used to identify a particular period of time. Archaeologists don’t look for fossils, but they can use other types of artifacts that don’t decay to do something very similar. One type of artifacts archaeologists find are stone tools. Stone doesn’t decay, so these artifacts can sometimes be the only thing archaeologists find at very old sites. What archaeologists often find are small chips of stone or the debris (debitage) from making stone tools; other times they find a whole tool. When archaeologists find a whole tool, they compare it to the index type from the different time periods. If the artifacts match archaeologists can date the site the artifact was found at to that time period. Chances are you’ve been using a simple version of this kind of method since you were a kid! Do you remember this song from Sesame Street? Archaeologists in Ontario use index types fairly regularly and often refer to this method as indexing. Indexing is a very common dating method used by archaeologists who study the Paleo-Indian (12,000–9,500 BP) and Archaic (10,000–2,800 BP) time periods. Paleo-Indian and Archaic sites are generally very small, and don’t have pottery to date using seriation. Superposition often isn’t able to help archaeologists discover the age of the site or artifacts because farmers have often plowed the soil layers together over and over again. On top of that, there are often no organic samples to do radiocardbon tests on. Over time, though, archaeologists have learned that some styles of artifacts are only found during certain time periods—just like paleontologists have learned that some fossils are only found during certain time periods, which means they can used these artifacts to index a site. For example, Nanticoke Notched projective points are a type of stone tool only found between 1400-1500 CE in Southwestern Ontario. 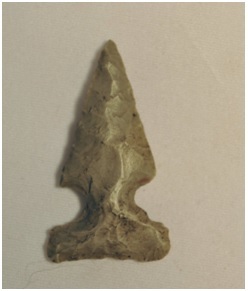 All Nanticoke Notched points look similar, so when archaeologists find a new point that looks the same they call it Nanticoke and say it was made between 1400-1500 CE. 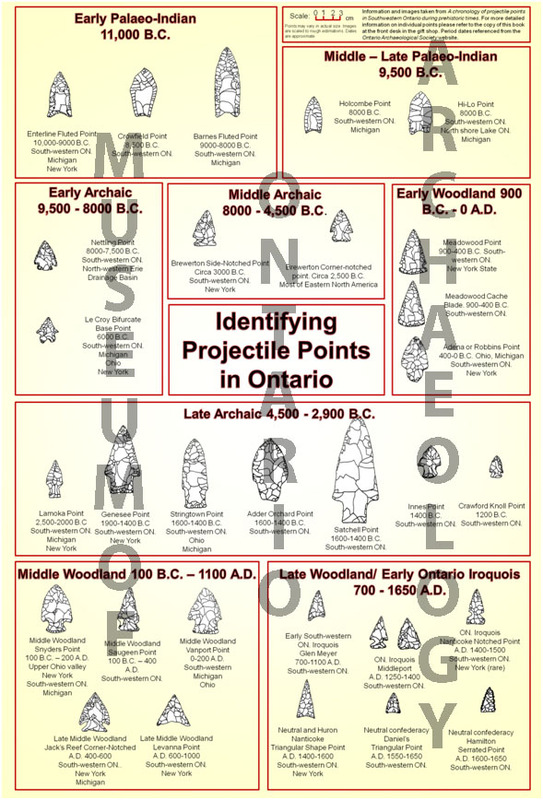 Ontario Iroquois Nanticoke Notched style projectile point. Artifacts like projectile points, which have distinct styles, can be compared to an index of tools. Archaeologists use the index to see if the style is unique to a particular period and give it an approximate date. 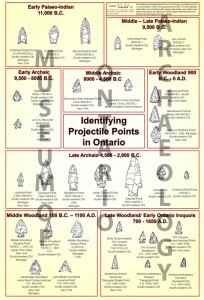 This poster shows a number of projectile points that are common in Ontario. If archaeologists find a point that looks like X, they can date it to that time period. Like the poster? You can buy it at our gift shop. Even though indexing is similar to seriation, they don’t do exactly the same thing. Remember, seriation only shows how the style of artifacts changed over time and figures out the age of a site by looking at a series of artifacts that were made over a long period of time. An index of tools, or indexing, uses one style of artifact that is unique to a certain time period to represent that period, and date artifacts that are a similar style.